Gravity PDF v5 is now available to the public! The highlights include full PHP 7.1 / 7.2 support, a bunch of bug fixes to the PDF Table of Contents feature, decoupling the Core Font fonts, and PDF Background Processing. Minimum WordPress version is 4.8+. 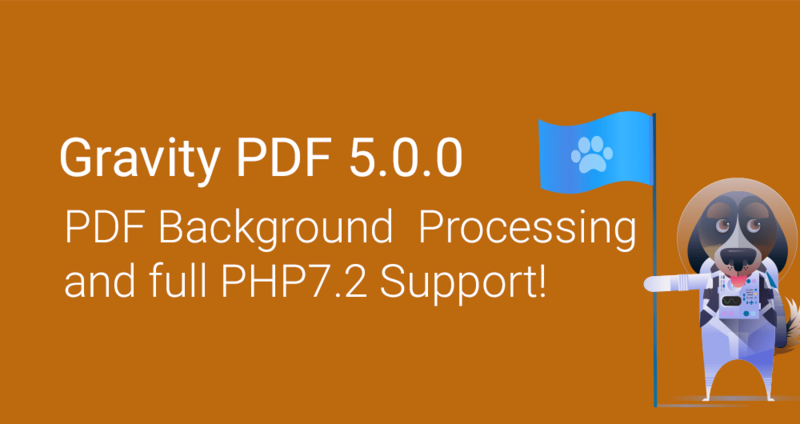 The PHP version has been increased to accommodate version 7.0 of the mPDF library (what we use to generate PDFs), which is fully compatible with PHP7.2 – no more PHP notices / warnings – and a number of bugs related to the Table of Contents feature have also been resolved. The minimum Gravity Forms version bump has allowed us to remove a lot of legacy code, as well as introduce a new feature: PDF Background Processing. While the WordPress version bump has given us access to newer APIs which we will take advantage of in future 5.x releases. The installation process now has an extra step because we’ve decoupled the PDF fonts from the plugin. Zipped up the plugin now only weighs 4.6MB – a 21MB reduction over version 4. After the initial plugin activation you’ll be prompted to install the fonts using the Core Font Installer. This only needs to be done once and the installed fonts will survive plugin updates. Decoupling the fonts solves a number of problems, but the biggest issue fixed is for users on low-resource shared hosting that had trouble with one-click updates from WordPress.org. Out of the box Gravity PDF will generate PDFs and attach them to your Gravity Forms Notifications while the user is submitting the form. Depending on the PDF complexity and number of documents to create, this can mean the user is waiting a considerable amount of time for these processes to complete before seeing your Confirmation page. Now, you can opt into PDF Background Processing (located in the global PDF settings) to handle the generation and sending of the PDFs in a background task. Once enabled, you’ll see a noticeable drop in the time between clicking “submit” and seeing the confirmation page. This feature also applies to Gravity Forms Resend Notifications feature. If you wanted to re-send 250 notifications with a PDF attached in version 4 you’d quickly run into timeout or memory issues. With PDF Background Processing enabled, those 250 notifications and associated PDFs will be queued up, generated and emailed in the background. We’ve left this functionality off by default because some websites cannot trigger the background processes automatically. You can check if your website supports this feature by looking for “Background Tasks” on the Gravity Forms System Status page. As this feature matures, we put in place more checks and balances for background processing, and create better documentation, we’ll enable this feature by default for new installations. Aside from Background Processing and Mpdf v7 with full PHP7.2 support, we’ve a number of improvements for developers. We’ve updated all PHP/JS libraries to their latest versions. Most notable of these are React and Immutable.js, which were re-licensed to MIT last September. To assist with debugging, if a PDF generation error occurs while an administrator loads a PDF the error message will now display the PHP file and line number that error occurred. We also removed the legacy /resources/ directory that contained almost 3MB of images and was used in example PDFs that shipped with version 3. Gravity PDF v5 is available via the WordPress one-click update feature in your admin area and via WordPress.org. It’s recommended to review our v4 to v5 migration guide before proceeding. Breaking Change: Decouple the fonts from the plugin. Jake Jackson is the head developer at Gravity PDF. Along with developing the plugin, he uses his expertise to provide support and technical information to Gravity PDF users.